BACKGROUND: The association between maxillary development and vector relationships is used in the field of plastic surgery, but the validity of this principle has not been tested yet. AIM: The aim of this study is to determine whether visual classification of anterior malar projection using vector relationships is supported by cephalometric analysis. MATERIALS AND METHODS: Normal, healthy 40 subjects aged 10–15 years with no history of orthodontic treatment, craniofacial syndromes, or trauma formed the study group. These subjects based on the visual assessment of vector relationship (positive and negative) were divided into 2 groups (Group A and Group B), consisting of 20 subjects each. Vectors were drawn on the profile photographs. 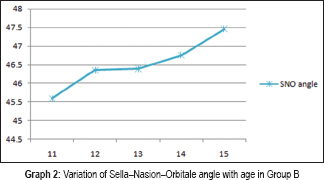 Sella–Nasion–Orbitale (SNO) angle were traced using the Nemoceph software. The relationship of anterior malar projection obtained from profile photograph and lateral cephalogram were compared. The data obtained were subjected to statistical analysis. RESULTS: Skeletal differences between the positive and negative vector groups based on SNO angles were statistically significant (P < 0.001). SNO angulations in the negative vector group were smaller than the positive vector group by an average of 5.9°. CONCLUSIONS: Visual assessment of vector relationship can be effectively used to classify anterior malar projection. This also helps in diagnosing maxillary hypoplasia and executes different treatment modalities. To achieve an esthetic profile, there must be a balance among the facial promontories include nose, chin, and malar prominences. Any single promontory out of proportion with the rest would make the other promontories look more or less protrusive. In an effort to qualify and quantify esthetic facial profile, various analyses have been developed with the advent of cephalometrics. Apart from diagnosing and treatment planning, lateral cephalograms also aid in predicting hard tissue and soft tissue responses to the orthodontic treatment, as there is ease in procuring, measuring, and comparing (superimposition) hard tissue structures. These advantages of cephalometric analysis have led to a heavy reliance on cephalometry and less emphasis of clinical examination in orthodontic treatment planning. However, relying only on cephalometric analysis may lead to esthetic problems, due to inadequacy in evaluating facial disharmony depending on the amount of soft tissue covering which can vary with the dento-skeletal pattern. Hence, a comprehensive facial trait analysis should be used to enhance diagnosis, treatment planning, and the quality of results for both surgical and nonsurgical patients. With a comprehensive analysis, esthetic problems can be optimally corrected and esthetic decline can be avoided by orthodontic tooth movement. Facial esthetics is of utmost importance to the orthodontist, of which midface is considered to be of prime importance. Pop culture emphasized that people with high malar prominences and angular faces appear to be beautiful. On the other hand, people with midface deficiency tend to have a gaunt or hollow midface leading to increased show of the sclera inferior to the pupil. This creates a perpetually tired, older, and sad appearance. With aging, the soft tissue atrophy and sagging reduces malar soft tissue prominence and moves the latter to a more inferior position. There is a shortage of diagnostic criteria in the orthodontic literature regarding the role of midface in facial esthetics. The skeletal structures of the midface are difficult to assess in lateral cephalograms and there are no readily available instruments for making accurate, reproducible measurements of orbital rim relationships. This has led orthodontists to focus entirely on the premaxilla for classification of maxillary skeletal development. Furthermore, there is no agreement among the authors on the best method to assess and quantify the midfacial hypoplasia. Thus, the aim of this study was to determine whether visual classification of anterior malar projection using vector relationships is supported by cephalometric analysis. This was achieved by assessing and comparing the anterior malar projection obtained from the profile photograph and lateral cephalogram. Ethical clearance to conduct the study was obtained from the Institutional Review Board. Normal and healthy subjects aged 10–15 years visiting our department for orthodontic treatment were screened for the study purpose. Subjects with informed written consent. Forty subjects who fulfilled the criteria formed the study group. These subjects, based on their visual examination of the anterior cheek mass relationship to the anterior corneal plane, were divided into two groups (Group A and Group B). The anterior corneal plane is the line drawn from the most prominent part of cornea to the anterior cheek mass to determine the vector relationship. If the anterior cheek mass was ahead of corneal plane, it was considered as positive vector (Group A) and if the anterior cheek mass was behind the corneal plane, it was taken as negative vector (Group B). Each group consisted of 20 subjects. Profile photograph was taken for each subject using a digital camera (Canon EOS 550D, 18 megapixel). Profile photographs were standardized by orientation of the patient's head in the Frankfurt horizontal position. And they were made to sit in an upright posture with lips relaxed. On the digital profile photographs, vectors were drawn for all the subjects using Microsoft Paint (Windows 10) by drawing a line from the most prominent part of cornea to the anterior cheek mass. Lateral cephalogram was taken using cephalostat machine (PLANMECA Extraoral Radiograph Machine) with the subject standing upright, relaxed lip posture, and Frankfort horizontal plane parallel to the floor. In order to quantify skeletal support for each subject, Sella–Nasion–Orbitale (SNO) angulations were used to evaluate the antero-posterior position of the malar eminence relative to the cranial base. This measurement was selected according to the previous works of Leonard and Walker  and Walker. Orbitale was identified to coincide with Walker's cephalogram point 109. The key ridge and the maxillary sinus were used as guides to consistently locate this landmark. On the digital lateral cephalogram, using Nemoceph software, cephalometric landmarks (Sella, Nasion, and Orbitale) were traced. SNO angles were measured for both the positive and negative vector groups. A trained and calibrated investigator carried out all the procedures of the study to avoid the inter-examiner error. Cephalograms were traced by the examiner three times with a minimum of 2 days between tracings. Prior to the cephalometric analysis, 15 random lateral cephalograms from subjects in the study were selected, and SNO angles were traced and measured at 2 times within a week by the same operator. The intraclass correlation coefficients (ICC) indicated excellent intraobserver agreement for SNO measurements (ICC 5.98) using the specific criteria for landmark identification. Descriptive statistics were calculated for angular measurements of Group A and Group B, and significant differences between SNO measurements for Groups A and B were assessed with a Mann–Whitney U test. The mean of SNO angle in the positive vector group was 52.420 ± 2.51 and in the negative vector was 46.520 ± 2.23. The mean difference between the groups was found to be statistically significant [Table 1]. The SNO angle with age in Group A ranged from 50° which later increased to 51° and decreased further from 50° to 49.5° [Graph 1]. The variation of SNO angle with age in Group B showed a rise in angle from 45.5° to 47.5° [Graph 2]. There has been a paradigm shift in diagnosis and treatment planning from focusing on hard tissue to the soft tissue considerations. Orthodontists are concerned with establishing balance in facial profile and occlusion. In particular, they diagnose and treat malocclusion according to the facial profile. A comprehensive facial trait analysis should be used in order to enhance diagnosis, treatment planning, and quality of results. Erkan et al. studied the reliability of four different computerized cephalometric analysis programs and concluded that there is no statistically significant difference between the studied cephalometric analysis programs. Nemoceph software was used in the present study to digitally trace the lateral cephalograms and measure the SNO angle. According to Enlow, secondary displacement carries the malar complex downward and forward as growth occurs in an upward and backward direction. Further, the anterior maxilla and anterior zygoma undergo resorption, while the supraorbital rim and lateral nasal complex remodel in a forward direction. The lateral zygoma and zygomatic arch have depositional surfaces, thus increasing the lateral malar prominence and maintaining the width of the face in proportion to that of the jaws. All of these changes result in a redistribution of the facial promontories. The nose, supraorbital rim, and possibly the lateral malar complex become more prominent, while the anterior portion of the malar complex becomes lesser prominent, thus allowing clinicians to identify malar retrusion during early stages of development. Therefore, the present study was carried out among young children of 10–15 years of age. Various two-dimensional facial analysis studies have been carried out to evaluate and diagnose malar deficiency.,, Hinderer placed different size malar implants on the plaster cast of a patient's face to evaluate and determine the level of deficiency. Wilkinson drew a line from the outer canthus to the border of the mandible and stated that the malar eminence was located just posterior to that line, at a location one-third the distance from the outer canthus to the border of the mandible. This technique was criticized as it could not define the relationship between the vertical line from the canthus and the intersection point with the mandible and thus allowed for large variability in the reference line placement on the face. Bell in 1992 related the malar prominence position to the cornea and supraorbital rim. He stated that from a lateral view, the supraorbital ridges should be 4–8 mm beyond the cornea and that the malar eminence should be even with or slightly beyond the cornea in the profile view. Powell et al. found that the malar eminence was most esthetic at the Frankfort horizontal plane. The malar eminence was found to be 2–2.5 cm lateral to the lateral canthus of the eye. They concluded that “in patients with flat cheek bones laterally, or with full cheeks anteriorly, second to buccal fat, the exact eminence was difficult to establish” In a study by Frey, in the young white adolescents, the ideal projection of the cheek prominence was found to be approximately 2 mm beyond the anterior surface of the cornea in the sagittal plane along the Frankfurt horizontal plane. This method was found to be reliable and reproducible. In the present study, on the clinical photograph, a line was passed from the most prominent part of cornea to the anterior cheek mass as an effective means of diagnosing malar deficiency. A wide variation in landmark identification of Orbitale has been observed in the past. Leonard and Walker determined the relative deficiency of the orbital rim in relation to the maxilla using a cephalometry. One of their assumptions was that the malar eminence is “always lateral and inferior to the Orbitale” and Orbitale was chosen to represent the malar eminence on the lateral cephalometric radiographs. Thus in the present study, the Orbitale was considered for measuring SNO angle to evaluate the anterior position of malar eminence relative to cranial base. The key ridge and the maxillary sinus were used as guides to consistently locate this landmark. These landmarks were identified easily and were reproducible. SNO angles were traced and measured digitally on the lateral cephalograms to confirm the clinical findings. Leonard and Walker found that a posteriorly positioned maxilla defined by a small SNA and a retruded orbital rim were found conjointly, but an anteriorly positioned maxilla defined by a large SNA was not always related to an anteriorly positioned orbital rim. They concluded that in maxillary advancement cases, it was essential to consider the malar prominences in diagnosing the maxillary deficiency; else one might not fully correct the appropriate deficiency. As in case of malar deficiency combined with maxillary deficiency, it was necessary to consider a Lefort II surgery that would also advance the malar prominences and not just the lower maxilla as in Lefort I surgery. Whitaker in 1986 described the division of the malar complex into three areas. These were (1) the paranasal or medial midface fullness, (2) the malar prominence, and (3) zygomatic arch projection laterally and posteriorly. The malar prominence was the average of the two, creating anterolateral fullness and depth to the face. However, this study did not specify landmarks to describe the borders of these areas and only spoke of these areas in general terms. Similar study by Prendergast and Schoenrock defined the malar eminence as the point below the lateral canthus that gives the impression of being the most prominent point of the malar mound in any view. They believed the oblique view was the most valuable in the assessment of the projection of the malar eminence. Obliquely, a line was drawn from the lateral canthus to the ipsilateral commissure and found that two thirds of the distance went through the most prominent point of the malar complex. The drawback of this method was locating these landmarks and correlating them. In the present study, definite landmarks were considered both on clinical photograph (cornea and anterior cheek mass) and lateral cephalogram (SNO angle – Sella, Nasion, and Orbitale) to evaluate the malar prominence. Powell et al. divided the malar prominence into medial and lateral segments with a vertical line through the outer canthus delineating the border. He stated that the medial segment was usually deficient in craniofacial deformities such as Treacher Collins syndrome More Details and in cases of trauma. On the other hand, the lateral segment was usually augmented in cases of minimal deficiency for improvements in cosmetic appearance. They also used 3D reconstructions of facial computed tomography scans to evaluate and derive a new analysis for determining accurate localization of the malar eminence. In the present study, SNO angulation in the negative vector group was smaller than the positive vector group by an average of 5.9° and the difference was statistically significant. These findings suggest that vector relationships are an effective means of classifying anterior malar support during macroesthetic evaluation of the patient. The stability of these vector relationships has been demonstrated using derived growth curves of sagittal orbital relationships from preadolescence to adulthood, allowing early identification of malar hypoplasia. Frey found that the SNO angulations in the negative vector group were smaller than the positive vector group by an average of 60. He concluded that individuals displaying a negative vector relationship had significantly reduced malar support when compared to the subjects exhibiting a positive vector relationship and the difference was highly significant. The type of malar defect varies from patient to patient and can vary from one side of the face to the other. Therefore, there is no single method developed which can identify the malar eminence accurately. Deficient malar and midfacial projection leaves the soft tissues poorly supported, resulting in premature lower lid and cheek descent as well as visible bags, scleral show, and a more aged appearance. Though scleral show has been a traditional hallmark of maxillary hypoplasia, greater attention must be focused on regional hypoplasias within the maxilla, including those presenting in the absence of malocclusion. Using vector relationships as part of a dentofacial analysis not only provides the orthodontist with a convenient means of classifying malar support and help in making better treatment decisions but also assists the practitioner in evaluating the need for alloplastic augmentation of the inferior orbital rim and selecting the appropriate maxillary surgery. As the clinical findings correlated with the cephalometric findings obtained from this study, visual assessment of vector relationship can be effectively used to classify anterior malar projection. This also helps in diagnosing maxillary hypoplasia and executes different treatment modalities. However, the limitations of the present study were that it did not estimate the gender differences between the positive and negative vector groups, and angular measurements used to estimate anterior malar projection are the projection of three-dimensional object on two-dimensional surface. Future studies may be taken up by using three-dimensional imaging techniques to measure facial dimensions as they actually exist and not as projections of three-dimensional objects on two-dimensional surfaces. Analyses of skeletal differences between the positive and negative vector groups based on SNO angles were statistically significant. SNO angulations in the negative vector group were smaller than the positive vector group by an average of 5.9°. The subjects exhibiting a negative vector had significantly reduced malar support when compared to those with a positive vector. Visual assessment of vector relationship can be effectively used to classify anterior malar projection. This also helps in diagnosing maxillary hypoplasia and executes different treatment modalities. Terino EO. Alloplastic facial contouring by zonal principles of skeletal anatomy. Clin Plast Surg 1992;19:487-510. Arnett GW, Bergman RT. Facial keys to orthodontic diagnosis and treatment planning. Part I. Am J Orthod Dentofacial Orthop 1993;103:299-312. Terino EO, Flowers RS. The Art of Alloplastic Facial Contouring. 1st ed. St. Louis: Mosby; 2000. Schmidseder J. Aesthetic Dentistry. New York: Thieme; 2000. Bell WH. Modern Practice in Orthognathic and Reconstructive Surgery. Vol. 2. Philadelphia: W. B. Saunders Co.; 1992. Frey ST. New diagnostic tenet of the esthetic midface for clinical assessment of anterior malar projection. Angle Orthod 2013;83:790-4. Farkas LG. Anthropometry of the Head and Face. 2nd ed. New York: Raven Press; 1994. Leonard M, Walker GF. A cephalometric guide to the diagnosis of midface hypoplasia at the le fort II level. J Oral Surg 1977;35:21-4. Walker GF. A new approach to the analysis of craniofacial morphology and growth. Am J Orthod 1972;61:221-30. Erkan M, Gurel HG, Nur M, Demirel B. Reliability of four different computerized cephalometric analysis programs. Eur J Orthod 2012;34:318-21. Enlow DH, Hans MG. Essentials of facial growth. 3rd edition. Philadelphia, London, New York: W.B. Saunders. 1996. Hinderer UT. Malar implants for improvement of the facial appearance. Plast Reconstr Surg 1975;56:157-65. Wilkinson TS. Complications in aesthetic malar augmentation. Plast Reconstr Surg 1983;71:64371(5):643-49. Powell NB, Riley RW, Laub DR. A new approach to evaluation and surgery of the malar complex. Ann Plast Surg 1988;20:206-14. Leonard MS, Walker GF. A cephalometric study of the relationship between the malar bones and the maxilla in white American females. Angle Orthod 1977;47:42-5. Whitaker LA. Aesthetic augmentation of the malar-midface structures. Plast Reconstr Surg 1987;80:337-46. Prendergast M, Schoenrock LD. Malar augmentation. Patient classification and placement. Arch Otolaryngol Head Neck Surg 1989;115:964-9. Mulliken JB, Godwin SL, Pracharktam N, Altobelli DE. 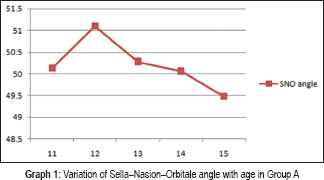 The concept of the sagittal orbital-globe relationship in craniofacial surgery. Plast Reconstr Surg 1996;97:700-6.